This name is is shown in the IDE menu. The directory, where to start the tool. All relative paths will be relative to this. Parse the output for FPC messages and jump to errors. Only available on MS Windows. Creates a console. Default is false. Since 1.7. Only available on MS Windows. Do not show the application window. Default is true. Since 1.7. Parse the output for make messages and jump to errors. Define the shortcut for this tool. This is optional. You can use macros in the programfilename, the parameters and the working directory. 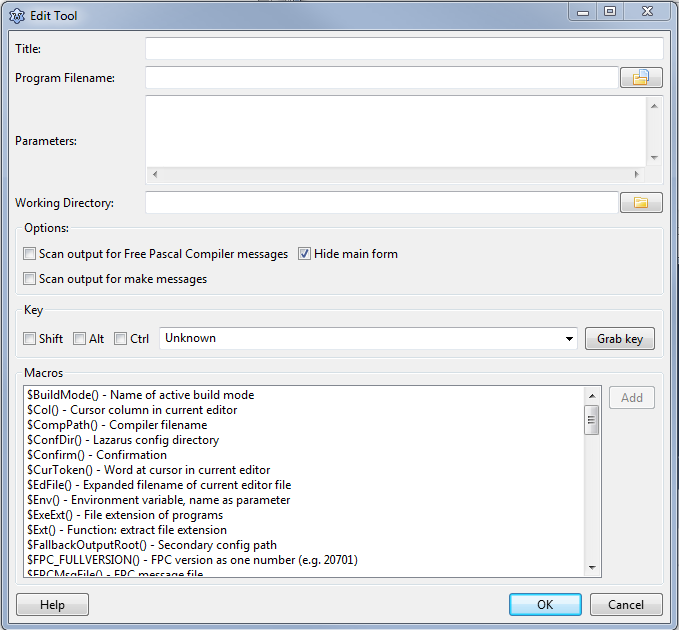 See IDE Macros in paths and filenames. Choose <Tools><Configure External Tools> from the lazarus main menu and setup the following. Then choose <Tools><Configure External Tools> from the lazarus main menu and setup the following. If you want to add an additional function to update the Lazarus sources from repository, then you can create another batch-file with the following content. This page was last modified on 22 September 2016, at 12:32.